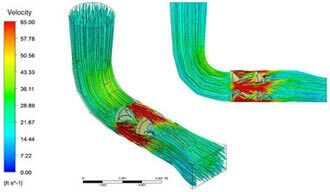 The Objective: Simulating air and fuel flow inside the modified inlet duct to visualize flow pattern and analyze flow properties distribution. Solution: The modified inlet duct design was analyzed for air-fuel mixture uniformity, considering the effects of upstream and downstream baffles. Using realizable k-epsilon turbulence model, the fluid flow behavior was accurately predicted to identify wake regions along the duct length. Using species transport equations, fuel mass and mole fractions were calculated and the results were found satisfactory at the duct outlet. Regenerative thermal oxidizers are excellent in treating harmful exhaust gases through heating. The efficiency of these pollution control devices rely upon the heating ability, achieved through efficient burning of air-fuel mixture using burners. The uniformity in air-fuel mixture is thus important, which is usually achieved by placing baffles at appropriate locations along the length of the inlet duct. Hi-Tech provided a simulation solution to predict the mixture uniformity inside the inlet duct, designed for a customized regenerative thermal oxidizer developed by a leading air pollution control systems manufacturer from USA. The fluid domain for the inlet duct was developed, considering the upstream and downstream baffles as well as fuel quills. 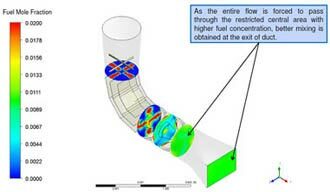 Boundary conditions such as fuel and air mass flow rate were applied and appropriate turbulence model along with conservation equations were solved using ANSYS Fluent. To determine the species concentration, incompressible flow model with species transport equations were solved. Pressure and velocity distribution across the duct as well as mass and mole fraction of the fuel were measured. The results indicated a uniform concentration of fuel with the air near the duct outlet.